Goyo comes from one of the most respected winemaking families in the Ribera del Duero. Greatly inspired by natural winemakers, like Pierre Overnoy from the Jura, Goyo started to produce his own naturally made wines in 2003. He farms 3 tiny single-plots in the heart of Ribera del Duero, near the town of Roa, all of them interplanted with white grapes, on different soil types and altitudes. The idea is to come back to the past and let the vineyard –rather than each individual grape variety– fully express itself. To accomplish that he works with very old, traditionally head-pruned vines, harvests first for acidity, and then co-ferments red with white grapes together, as things were done in Ribera del Duero back in the good old days. All of his wines are de-stemmed, fermented exclusively with wild yeast, and nothing is added during elevagé (including SO2). The wines are raised in old French barrels at an underground, century-old cueva located in Gumiel del Mercado. Goyo also makes wine in Cantabria, the region where his mother comes from, high up in the Picos de Europa mountain range, where there is a little known out-cropping of old vine Mencia and Palomino planted on pure broken slate. With the help of a viticultor from the area, Goyo uses similar practices as his Duero reds to produce beautiful mountain-laden, mineral-inflected natural wines. That’s right, Palomino gone wild! Cobero Blanco Comprised of 100% old bush vine Palomino grown on brown slate soils in between 500-600 meters elevation around the town of Potes in the Valle de Liébana, Picos de Europa, Cantabria - “Cobero” Blanco is fermented on the skins in stainless steel tanks without added yeast, sulfur, or any exogenous winemaking products. The resultant wine (not fined or filtered) possesses an orange-ish hue with aromatics of pear, chamomile, and minerals. Cobero Blanco is meant to be enjoyed with richer seafood, especially river fish, like trout, and an array of cheeses. Cobero Tinto This unusual red wine is comprised of 80% Mencía and 20% Palomino, a vineyard mix often-times found in the Cantabria region in northern Spain. The vines are at least 80 years old and are planted on broken slate soils. The wine was co-fermented, red and white grapes, with wild yeasts in steel vats, and then raised for 12 months in old French oak barrels without any SO2, yielding an aromatic wine, red in color, with formidable structure, like Morgon meets Barolo. Cobero Tinto pairs well with game, fowl, richer seafood, like Tuna and Swordfish, and even heartier grilled meats. Finca El Peruco Comprised of 85% Tinto Fino (Tempranillo) and 15% Albillo, Finca El Peruco is a single vineyard that sits at 1,000 meters elevation, one of the highest points in the Ribera del Duero, on profoundly chalky, clay-calcareous soils. 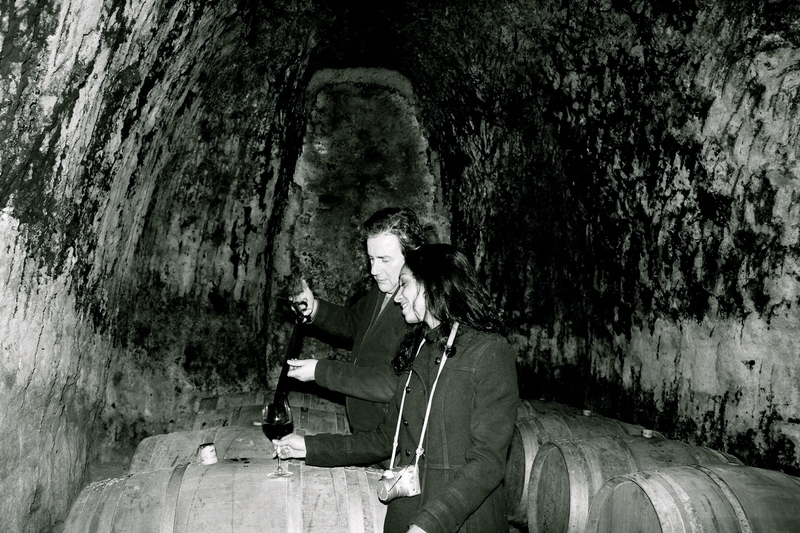 The wine was fermented in a small foudre and then raised in 14 year old barrels for at least 12 months and then another year or two in bottle before release. No sulfur or any other winemaking products were used in the making of this wine. The high elevation, chalky soils, and non-interventionist vinification gives a firmly coiled and austere wine, with powdery dark Burgundian-like fruit that coats the palate for minutes – a perfect wine to pair with a fine grilled piece of meat. Viñas de Arcilla This cuvee is the only mono-varietal wine that Goyo makes – 100% Tinto Fino (Tempranillo). It comes from a very old vineyard, where clay predominates, and the elevation is 800 meters elevation. Produced with a similar vinification and elevage as his other Ribera del Duero red wines, Arcilla is the fullest and most lush of his wines with formidable structure, but still juicy, red-fruited, and quite drinkable. Drink with classic Castilla y León fare– the suckling lamb of the region or any lamb or beef dish would be adequate, and add some of roasted wild mushrooms in there for good effect. Finca Valdeolmos Comprised of 90% Tinto Fino and 10% Albillo (Goyo co-ferments whatever is in the vineyard) grown on stony, sandy, limestone soils, and vinified like the other Ribera del Duero wines that Goyo makes, Finca Valdeolmos is the most vertical and aromatic of his red wines, with pronounced violet aromas, black pepper, and lovely mixture of dark and red fruits. The wine is extremely elegant on the pallet and pairs well with lamb chops or just about any elegant meat dish.